Woman In Digital: Merry CHRISTmas! Merry Christmas everyone! Here's a quick post to send warm wishes this Christmas Day! I hope you're all having a great time with your loved ones. If you're alone, please keep in mind that there's always someone who cares, his name is Jesus! At the moment, we're enjoying a holiday break (SeatsForTwo) here at Intercontinental Hotel Makati before it bids goodbye after December 31, 2015. The hotel has been in the business for 46 years. I've been here a couple of times attending blogger events. Surely, I will miss this nice place. 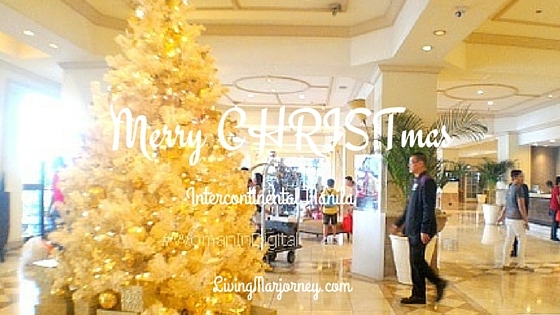 A week ago, we decided to booked a classic room to celebrate Christmas eve and Christmas Day at Intercon (Intercontinental) Hotel. As expected, everyone was busy, guests checking in and out of the hotel. We did not waited too long though, check-in was such a breeze. Being an IHG Club Member, I was given a free room upgrade from classic to suite room. I will tell you more about it soon, so keep coming back here and at SeatsForTwo.com for our staycation experiences.